NordicBet officially went online when the Olympic torch was lit on February 8 2002. Why was NordicBet created? Because at the time no online bookmakers were offering odds on our sports, Nordic sports. While everyone was covering the English Premier League, Wimbledon, NBA and NHL, no one was giving Nordic players betting on their local sports. The sports they grew up with and the leagues they went to watch live in Finland, Sweden, Norway and Denmark. Domestic football like Allsvenskan and Tippeligaen, ice hockey leagues like the SM-Liiga, or local sports like Pesäpallo or Winter Sports. We’re now 13 and we still hold onto the same philosophy. We are as passionate about local sports as we are global ones. In January 2013 we were fully acquired by the Betsson Group and in 2014-15 were the proud sponsors of the Champions Hockey League in its debut season. 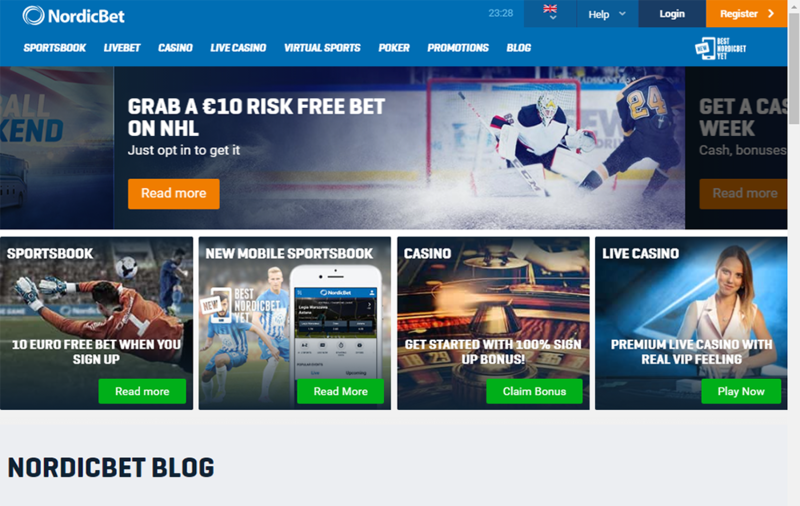 At NordicBet we offer a competitive gaming service, with our foundation built on sports betting. We have continuously expanded our LiveBet offer and now have more games and markets covered than ever before. We have also improved our Livestreaming offer by 500% so our customers can enjoy watching the sports they wish to bet on. Like Serie A, Ligue 1, NBA or the KHL. And just as we’ve expanded in our products, we’ve now also expanded the countries we operate in. From the summer of 2015 you can also bet with NordicBet if you’re from the Czech Republic, Germany or Switzerland. Great news for Czech customers who love ice hockey and football and Swiss sports fans who like predicting who will shine at the major Winter Sports events, on the ice hockey rink or whether Stan Wawrinka and Roger Federer will go all the way at the next big tennis tournament. And for German customers who love the thrills of the Bundesliga, the major European league with the most goals per game. Or who love the Premier League where Bastian Schweinsteiger, Mesut Özil and Emre Can are just some of the German stars in action. Or those who follow the ATP and WTA Tours where Philipp Kohlschreiber, Dustin Brown, Sabine Lisicki and Angelique Kerber are amongst the big name German players to look out for. Whether you’re betting on or against them, you’ll have a great time predicting what will happen next. We pay high attention to customer service and satisfaction, and offer you an excellent customer support service with quick response by phone or e-mail. Please see the “Support” section for details on how to contact us and make use of our customer service. Taking part in our casino and poker games and making bets in our sportsbook is a matter of trust, and we will be doing our utmost to earn yours. We will be doing this through good service, quick payouts of winnings and an attractive and updated product offer.